Final reconstruction of my favorite Triassic animal (and perhaps my favorite non-dinosaurian Mesozoic animal), Shringasaurus indicus. A member of the bizarre archosauromorph clade Allokotosauria, it made some waves when published a couple years ago (2017 I think?) due to its big "hump" on the back and twin forward-curving horns on top of the head. However, as you can see this particular rendition differs from the popular image of this animal in a few key ways. I based my reconstruction on Ashley Patch's (aka PLASTOSPLEEN's) skeletal, which came about after her realization that the skeletal in the description was just a slightly modified Azendohsaurus. The result is a massive, more front-heavy beast with less of a conspicuous hump and more of a very thick, horse-like neck. With a posture taken from the Azendohsaurus monograph (sprawling hind limbs with near-horizontal femur and more upright forelimbs), the back now slopes downward posteriorly and the head is raised even higher, which is perhaps a vague convergence with macronarian sauropods like Brachiosaurus and an adaptation to reach the highest-possible vegetation to eat. 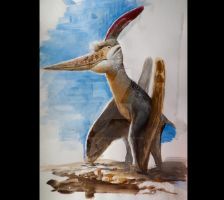 I initially thought it was quite unusual, although I both much prefer this new appearance and recognize it now more closely resembles another long-necked allokotosaur, Pamelaria. For the integument, I looked at a ton of extant reptiles like various iguana species, chameleons, and many others to try and come up with a believable covering of scales. Some features, such as the larger scales along the dorsal midline and the banded scales on the tail, are almost universal in lizards and other reptiles, so I typically include them in a lot of my scaly reconstructions. As far as the coloration goes, I've always imagined Shringasaurus as a relatively plain animal, and I ended up with this light yellowish/brownish/greyish tone evoking other large reptiles like Komodo dragons, rhinoceros iguanas and Galapagos tortoises. This seems more than plausible for a large-bodied herbivore living in a seasonal floodplain habitat. The only possible error I can see in this reconstruction are the hands, which I posed like both of the skeletals but may have been more flat-footed. Beautiful beast. Never heard of its existence before. Please allow me to compliment you, PBL on putting together such a splendidly convincing illustration of this singularly-draconian Prehistoric Beast! Now THAT'S what I call a properly old-school Prehistoric Beastie; I love, respect and am always nearly always delighted to nibble at the fruits of new scholarship, but sometimes you just want a whacking great scaly reptilian plucked from the Wilderness of Deep Time for feed one's appetite for something straight out of Charles Knight! Good morning, Shringasaurus look wonderful. This might as well be a fantastic beast! Love it! Hahaha Sorry, bad weaboo joke. the 'Shringa' in shringasaurus sounds like a mashed up 'Sharingan': a super power from the anime naruto (the red anime eyes with edgy black pupil designs that you'll be familiar with if you've ever preused the DA front page in the mid-2000s haha). My request was then a reference to 'mangekoyu sharingan' the 'level up' version of that super power in the same anime. Amazing depiction of a recently discovered creature! Great! The design looks good, the osteoderms are quite nice. The colouring is also good as well, love the Komodo dragon like coloring. Your welcome! Can't wait for the next azendohsaurid. This is great! I was hoping for a little more color, but I still appreciate your attention to detail. Thank you! And although I like bold patterns as much as the next paleoartist, not every animal is super colorful. I totally get that. I was just expecting a little bit of zestiness, you know, a dash of red here, a dash of green there. I'm always so amazed at your attention to detail. This is really awesome! Such a unique lookin' creature too. This is the iguana monster from Lost World 1960! Thank you so much! I'm glad I got to share it with someone new! To the past, present, or future!